Families and friends gathering together, partying, picnicking and having fun under the shades of cherry blossoms – surely such a sight is familiar to some of you, especially if you are Japanese, have stayed in Japan before or have visited the Land of the Rising Sun anytime between late March to early April. Indeed, it is around this time of the year when the Japanese have one of their most exciting outdoor gatherings annually – the Hanami festival (花見). Before we go on, let us be more acquainted with the main character of which the Hanami festival revolves around – the sakura. Ever heard of sakura? 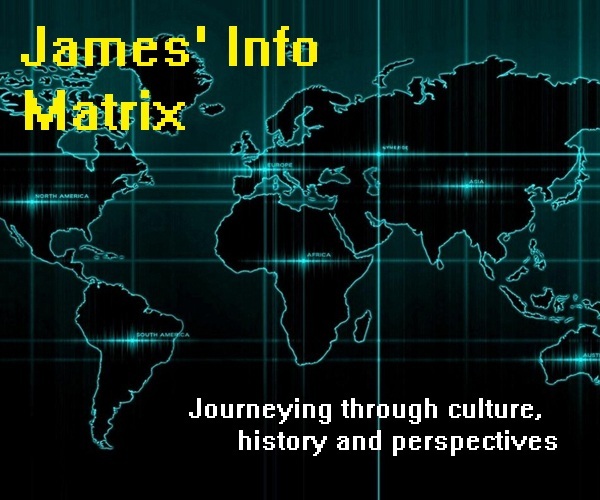 Well, for those of you who’ve not heard of such a thing before, let me explain to you. Basically, sakura (桜) is the Japanese name which refers to cherry blossoms, particularly those found abundantly all over Japan. 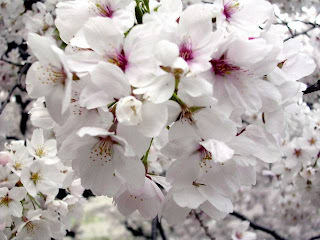 Cherry blossoms are flowers of the cherry tree which are native to many Asian nations, especially China, Korea and Japan. However, one would frequently associate sakura with Japan, since it is not only the national flower of the country, but also a centuries-old symbol of the island-nation’s heritage. The Hanami festival is the time of the year when the Japanese traditionally celebrate and appreciate the beauty of sakura. Sakura trees start blooming in Japan around mid-January to early May, but their full blossoms are only seen anytime from late March to early April, lasting for one to two weeks. As such, it is during this brief period when the Hanami festival is held. The name “Hanami” literally means “flower viewing”, denoting the main purpose for which the festival is held, that is to appreciate the beauty of sakura blossoms in nature. Besides its aesthetic essence, the Hanami festival also has a deeper and more philosophical meaning. Seeing that sakura are transient in nature, the Japanese often associate them with the shortness of life itself. The sakura blooms to the peak of its beauty just before it falls off, after which it gradually withers. To the Japanese, this symbolizes the passing beauty of life and existence itself. Nevertheless, many modern-day Japanese take this festival as an opportunity to have fun with friends and family members in the outdoors. In fact, there is a common saying, “dumplings rather than flowers” (花より団子, hana yori dango), which makes fun of people’s motives in observing this festival, implying that most people are more interested in the food and drinks during this festival rather than to view sakura. Annually, in the weeks prior to and during the Hanami festival, one would anticipate the “sakura front” (桜前線, sakurazensen) to be broadcasted on nightly news programs after the weather forecasts. 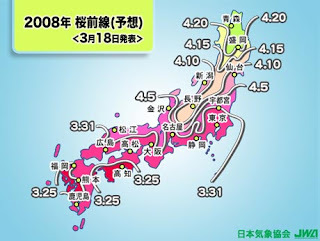 The “sakura front”, announced by the Japanese Meteorological Agency, regularly informs the public on the forecasted dates of sakura bloom in specific regions of Japan. 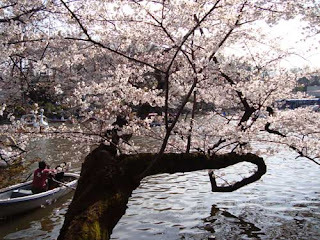 Customarily, many Japanese would follow the “sakura front” closely in order to plan their Hanami outings carefully, as the sakura bloom would only last for a short period of one to two weeks. During the Hanami festival, it is not unusual to see parks and gardens adorned magnificently with fully bloomed sakura, but at the same time crowded with lots of people. Throughout the entire period of this festival, family members and friends go out to have picnics and parties together under sakura trees, ushering in a whole new spring. Coincidentally, the period of the Hanami festival normally corresponds with the beginning of a new schooling and financial year, thus welcoming parties are also held during this period. Companies often organize Hanami functions for their employees while students frequently hold Hanami gatherings in conjunction with their first day of school. 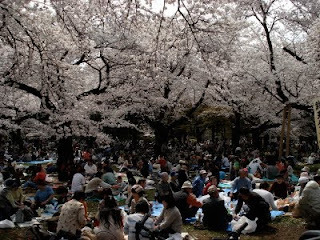 Amongst the most popular spots for Hanami picnics and gatherings are parks and gardens such as the famous Ueno Park (上野公園, Ueno Kouen) in Tokyo, Maruyama Park (円山公園, Maruyama Kouen) in Kyoto and Osaka Castle Park (大阪城公園, Ōsaka-jou Kouen) in Osaka. Of course, due to the popularity of such public sites, it is common for them to be crowded with people throughout the whole duration of the festival. As for those who prefer quieter spots for sakura-viewing, temples, schools, mountains or even private gardens may be more ideal spots. 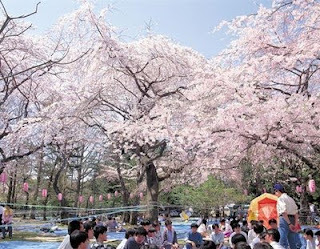 Hanami picnics and gatherings involve having lots of fun and food together with friends and family members. Many even fancy bringing their own karaoke sets outdoors to sing with good cheer. It is also not uncommon for Hanami gatherings and parties to span through the whole day and night until the wee hours of the next morning. 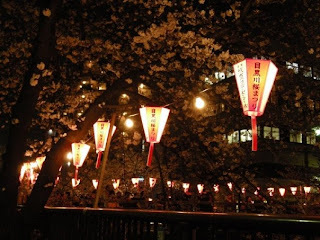 Such parties, which go on until nighttime, are known as yozakura (夜桜), which literally means “night sakura.” For the purpose of yozakura, sakura trees are often hung with lanterns, giving the sakura a magical ethereal appearance in their reflection. An important component of every Hanami festival, especially in these modern days, is none other than the delicious delicacies that await every Hanami picnicker. No doubt, the most popular food of this season is dango (団子), particularly Hanami dango which is made especially for the Hanami festival. 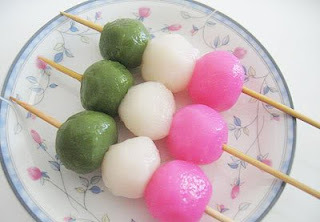 Hanami dango, which is a kind of dumpling made from rice flour, frequently consists of three round dumplings of different colours served on a small wooden stick. Another famous Japanese delicacy which appears more commonly during the Hanami season is sakuramochi (桜餅). 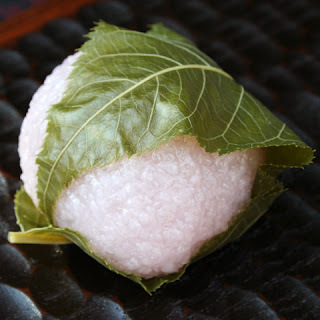 As its name suggests, it consists of a sweet mochi or rice cake mixed with red bean paste, wrapped with a sakura leaf. Besides Hanami dango and sakuramochi, many other Japanese delights are also favoured, such as yakitori (焼き鳥, grilled chicken), inarizushi (稲荷寿司, stuffed sushi), oden (おでん) and teppanyaki (鉄板焼き). As for drinks, sake (日本酒, Nihonshu) is commonly seen during this festival, although a vast variety of beverages are also enjoyed. 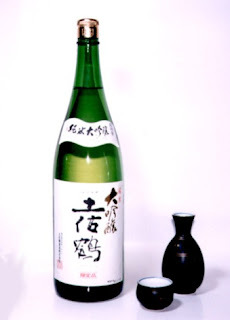 Sake is a type of Japanese alcoholic drink made from rice. In spite of the fact that the Hanami festival is widely celebrated throughout Japan today, the festival actually has its roots from Tang Dynasty China. During the Tang Dynasty (618 – 907), many members of the royalty, as well as people of aristocratic standing and noble birth enjoyed viewing the beauty of flowers blossoming in spring. It was during this era when Japan actively emulated and adopted into its culture many elements of Chinese culture and knowledge. Hence, this practice of flower-viewing during spring was also adopted by the Japanese royalty and aristocrats during the Nara Period (奈良時代, Nara-jidai) (710 – 794) and the Heian Period (平安時代, Heian-jidai) (794 – 1185). It was said that the practice of flower-viewing was popularized through frequent parties and feasts held during the reign of Emperor Saga (嵯峨天皇, Saga-tennou) (786 – 842). 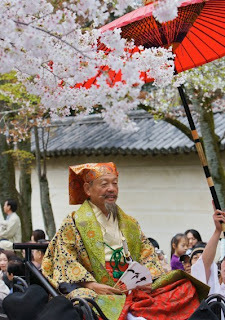 Emperor Saga, having adopted this practice from China, often held such parties under flower trees in the imperial court in Kyoto during spring. Such parties were prepared with lots of food and sake, in which many people from royal and aristocratic ranks were invited. Soon enough, the practice of flower-viewing spread rapidly within the upper class society of the era. Nonetheless, it was not until spring 1598 when one of the most extravagant sakura-viewing parties of all time was held. Only five months before his death, the renowned Japanese warlord Toyotomi Hideyoshi (豊臣秀吉) held his grand Daigo no Hanami (醍醐の花見) party in the Daigo Temple (醍醐寺, Daigo-ji), Kyoto. His idea of throwing such a grand Hanami party came about after a visit to the temple in the year before, in which he was utterly amazed by the beauty of sakura blossoms found in its compounds. Only a few weeks before the actual day of the party, Hideyoshi came to the temple once again and announced his wishes of holding a grand “garden party” in the temple grounds. He then ordered immediate reparation and restoration works to be done on the temple and its compounds. Hideyoshi showed much enthusiasm in preparing for his grand garden party. He personally inspected and directed the process of landscaping the temple grounds, making sure that everything was done according to his specifications. 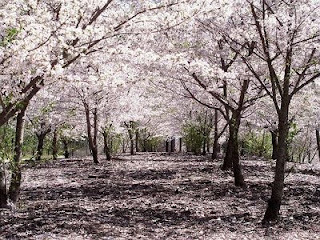 Some records state that about 700 sakura trees were specially brought into the temple grounds to be planted along a pathway in order to form a magnificent “flower tunnel” for guests to walk through. 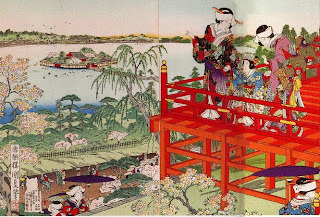 By the end of all the restoration and preparatory works, Hideyoshi was set to show off the beauty of his Hanami garden party to all his distinguished guests. Many distinguished guests, including many powerful Japanese warlords and landlords, were invited for the grand occasion. 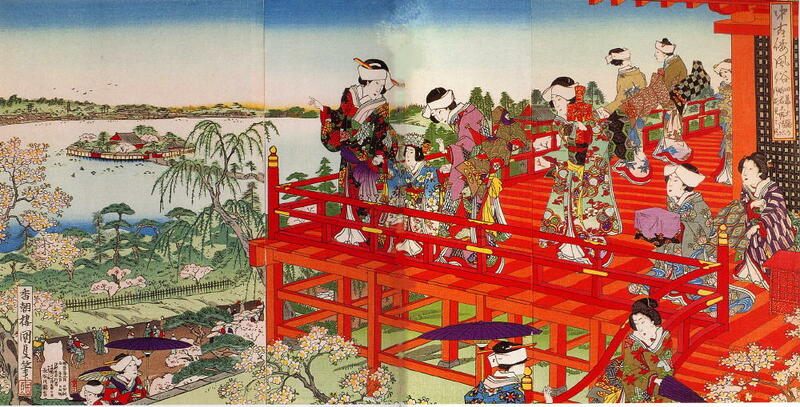 Before commencing the party, Hideyoshi led a huge procession of over 1000 distinguished guests to the temple grounds. Upon arriving at the venue, the party commenced with merriment, with lots of food and drinks available alongside traditional performances. As mentioned before, one of the highlights of the party was the “flower tunnel” in which guests could walk through to admire the beauty of blossoming sakura. Some of the guests also wrote poems describing the event and the symbolism of sakura, which I’ve mentioned earlier in this article. As a result of Hideyoshi’s Daigo no Hanami party, sakura-viewing gatherings and parties soon became a popular practice in spring amongst the privileged classes of Japan at that time. Coincidentally, many commoners and peasants also adopted their own practice of sakura-viewing, in which they would climb nearby mountains in spring to have lunch under the beautiful blooming sakura trees. These two different forms of sakura-viewing practices, practiced by the nobility and the common people respectively, soon fused together to evolve into a common culture of Hanami festivities. With Shogun Tokugawa Yoshimune’s (1684 – 1751) efforts in planting sakura trees in towns and cities to promote the practice of sakura-viewing, Hanami festivities eventually became a popular annual event every spring throughout Japan. Another interesting thing to note about the history of the Hanami festival is that it was originally not a sakura-viewing festival. It was said that during the Nara Period and the early years of the Heian Period, the practice of flower-viewing almost always involved plum blossoms and wisterias, while sakura were given little attention. Nevertheless, things changed after the famous Japanese novel ‘The Tale of Genji’ (源氏物語, Genji Monogatari) was written, in which a Hanami party involving sakura flowers was featured in the story. From then on, Hanami festivals began to be exclusively associated with sakura flowers. The popularity of the Hanami festival in Japan is indeed undeniable. What began as a practice of the Chinese nobility has now evolved by leaps and bounds to become one of Japan’s most anticipated festivals of the year. Doubtless to say, the Hanami festival is a time of the year when everyone in Japan can have a gala time of their lives, what with singing, eating and drinking filling up the atmosphere beneath the sakura trees with merriment and a sense of refreshment.